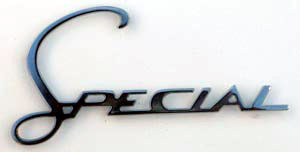 Special emblem for the legshield on SX and Li Special models. Chrome plated brass badge with integral posts which must be peened over on the inside of the legshield, just like the original badge. We suggest tool #1422 for this, but a ball pein hammer and a bodywork dolly covered with duct tape will do the trick. Made in Italy, excellent quality.